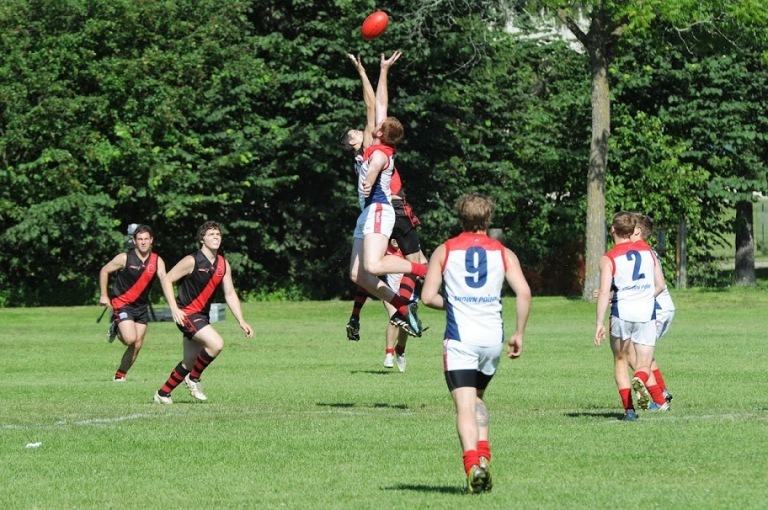 Early this past Saturday morning, the Dingos were able to put an end to their two-game losing streak, getting past the High Park Demons 9.15.69 to 5.9.39. In what was a solid but not spectacular performance, the Dingos got themselves the valuable four points, improving their record to 4-2-1 on the season and pushing themselves 10-points clear of the 7th-place Demons on the ladder. In what turned out to be a blessing on a scorching Saturday, the Dingos and Demons were set for an early 9:30am clash, with both teams looking to turn around a recent string of losses. The Dingos had lost two hard-fought battles with the Rebels and Eagles, while the Demons had not won since Round 2. Before the opening bounce, coach Justin Robertson emphasized the need for discipline for his club, reminding them of their 3-point loss the week before, when some undisciplined play had cost the Dingos valuable points. With a few of their regulars away (most notably longtime full-forward Craig "Silver Fox" Stewart and young onballer Jimmy "Hacksaw" Duggan), the Dingos knew that they were in for a tough battle on the day against a Demons squad known for their complement of young and fit Aussies. Leading the Dingos on the day as honorary captain was stalwart Bobby Clarke, playing in his 150th game for the club. Kicking towards the non-creek end of the Humber South oval, the first quarter was a see-saw affair with both clubs struggling with the dewy footy. Miscues and dropped marks were common as both teams settled into the grind. The Dingos seemed to get an early upper hand out of the middle, feeding the big targets of Wade Edwards and Chris Buczkowski up front. However, the Demons kept it close using some quick strikes to slot through a couple of majors. Quarter time saw the Dingos up slightly 3.2 to 2.1. Facing away from the sun in the second quarter, the Dingos' backline hoped to do a better job reading the footy and shutting down the Demons' target up front, Christian Doggett. Led by Bob Clarke, David Wells and Ramsey Blacklock were able to do a better job repelling the footy and keeping the Demons' chances to a minimum. Yoni Moussadji and rookie Kristian Frantzen were also instrumental in the halfback line, roaming wide across the ground and keeping the Demons' midfielders bottled up. Up front, Mick McFarlane was playing his usual gutsy game, taking hard hits but pushing the footy forward and scoring two goals on the day. Some inaccurate shots for goals kept the game close, but the Dingos were up at the halfway mark 5.8.38 to 3.4.22. As the third quarter started, the heat began to rise and the Dingos seemed to wilt a little. The young legs of the Demons took advantage and they made some great switches of play across the halfback line to free up their speedy runners. Despite having a consistent rotation through the middle, onballers Max Parish, Shawn McKay, Anthony O'Brien, Mal Brady, and Justin Robertson were unable to dominate as they had in the early going. Big Wade was able to kick another goal to extend the lead, but the Demons stormed back with one of their own and were putting pressure on the Dingos. Winger Gary Conlon took a great mark near the goal square but was unable to put it through and the Dingos went into 3-quarter time up 7.11.53 to 4.6.30. 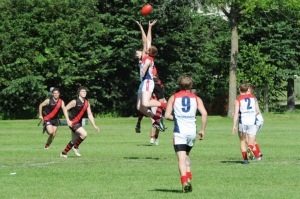 Trying to keep the Demons at bay in the fourth, the Dingos were lifted early by a great running goal by Matt Pollett. Continued strong ruck work by Tom Bell and D'arcy Hill kept the ball forward and the Dingos kept up the pressure on the Demons' backline, hemming them inside their half. Despite some surges from the Demons, the Dingos were able to run out the clock and finish up with a 30-point victory. BOG honours went to Yoni Moussadji for his strong work on the halfback line, with honourable mentions to Max Parish, David Wells, and Big Wade. Goals: Wade (3), Mick (2), Butch (2), Shawny, Matty. Up next, the Dingos play the Central Blues in both Division 1 and Division 2 matches on Saturday, July 20th at Humber South.